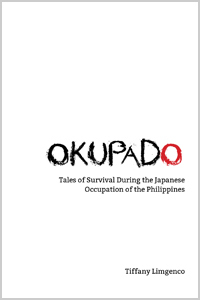 Okupado is a collection of 15 articles and interviews on the Japanese occupation of the Philippines in World War II. Amidst a pile of scorched wooden beams and crumbled concrete blocks, a man lies face down on the ground. His white shirt, torn along the shoulder, bears dark stains splattered across his back and at a puncture wound on his side. His arms, twisted behind him, meet at the wrists where thin rope cuts into his skin. The knot of a white blindfold presses against the back of his head.